Book Review: Pandemonium by Lauren Oliver - Book.Blog.Bake. As the viewpoint shifts between Lena’s time in the Wilds and the present day, which is set in Brooklyn, Lena transforms into a warrior for the resistance. In New York City, the grass-roots movement for a Deliria-Free America (the DFA) is gathering strength, and its leader, Thomas Fineman, recruits more supporters by the day. His son Julian–as-yet uncured–heads up the DFA’s youth organization. Lena is tasked with blending into the DFA’s rallies; she seems to be a supporter yet she is really a spy. 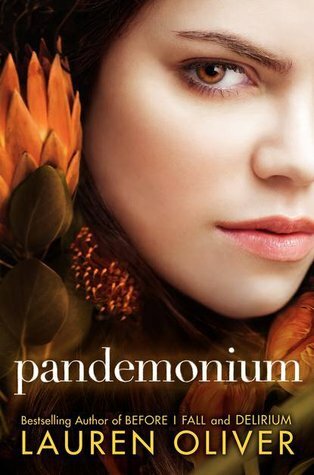 I’ll be honest: I was pretty disappointed with Pandemonium as the sequel to Delirium. I fell in love with Delirium right away. It simply blew away all my expectations and held me in a death grip made of excitement and beautiful writing, and I hoped Pandemonium would do the same. I know Pandemonium is the second book in the Delirium trilogy, so I still have high hopes for Requiem, but I will say my overall impression of this series is lower now. I missed that prose quite about through Pandemonium. This book is also told in two different in two different timelines: “Then” chapters and the “now” chapters. “Then” chapters follow Lena straight from the end of Delirium and document her time in the wilds, while the “now” chapters deal with Lena as part of the resistance and her interactions with the cured and the DFA. I am normally a huge fan of timeline and POV splits. I know many people don’t like them as a rule, but many times they’re my favorite way to read and to tell a story. However, I really just didn’t feel it in Pandemonium. I found the “Then” chapters much less compelling because they were interspersed throughout the book, so I already knew that Lena survived to the current point in time. It made them feel unnecessary. I think I would have liked this book a lot more if the story had been told chronologically. I will say I liked the inclusion of Julian’s character and the parallels that the relationship between Lena and Julian had to the relationship between Lena and Alex. I felt in many ways, Lena was playing the role for Julian that Alex had played for her to open her eyes up to the world around her and show her that love is not necessarily evil, as she had been taught. Even though I’m not sure how I feel about this new love triangle development, I did like how the relationships reflected each other in many ways. I also really enjoyed the story line of the book. At the end of Delirium, I knew that story could continue in so many different ways. I really wanted Lena to join the resistance, and I thought she would, but there was always that doubt in my mind. She had just undergone quite a tragedy and I expected more of Pandemonium to be dedicated to her starting to work through that. Also, as to the “twist” at the end: not terribly twisty. I always thought the story would end there, ever since the end of Delirium. I read novels with a lot of character deaths, and most of them have a certain “feel” for me. Alex’s death didn’t have that seem feel. I never really thought he died, so all of Pandemonium I was just waiting for him to show back up, which meant the ending didn’t really pack a punch for me. Final Impression: Ultimately, I found Pandemonium okay, but thought it was a bit weak as the sequel to Delirium. I’m still invested in the characters and their lives, but I wasn’t as much of a fan of the way this part of Lena’s story was told. The time-jumping and predictability make this read nowhere near the level of love I have for Delirium, unfortunately. 3/5 stars. Book Review: Before I Fall by Lauren Oliver | Book.Blog.Bake.